The last few days have been very difficult, with prayer intercession and a very deep grieving of the Spirit..! This has left me weak, tired and almost ill. I have been in very deep prayer and can see the DARK DAY approaching quickly now, descending upon this evil world and it’s system! Even as the rulers of this world set their plan and net, even they have no clue to the judgment approaching in this EVIL time……. The Middle East seems still churning with ‘trouble’ with many analyists and media groups being very concerned with the upcoming demonstrations planned on March 11, 2011 or as Richard Coombes warns: occult day 03-11-11 http://www.aoreport.com and the situation with Libya growing larger and more troublesome daily – oil output chaos and higher prices, per Lindsey Williams reports…..! Check news: http://standeyo.com with Stan & Holly..
Tom Horn has posted a new song by Stephanie Quayle [Steve Quayle’s daughter] for our troops in combat. Tom Horn posted from Raiders News Updates and the link which I hope works: <http:www.youtube.com/watch?v=oGNVeC76Puo> and is at itunes at this link: http://itunes.apple.com/us/album/i-remember-single/id424975568 and Tom’s website is http://www.raidersnewsupdate.com which recently was hacked & stolen about the time of Tom & Nita Horn’s mysterious home fire in Missouri…! Stewart Best is re-working his website http://www.thelightgate.com which is currently under construction and should be tomorrow’s [Thursday] guest on the Randy Yarbrough Show – heard on KHNC 1360AM Radio, Johnstown, Colorado or you can listen on the internet: http://www.americanewsnet.com The most recent Best-Taylor Web Audio Update is #159…. Good post! I have been wondering about you! I woke up Tuesday morning about 330am and began to think of people to pray for and I thought of you and your wife. I began to really pray in the Spirit for sometime in more of a battle mode! Thanks for all you share and do! Thanks, Larry! As always, you get to the heart of political and spiritual matters. May the Lord keep you and your precious family safe as He provides comfort and meets all your physical and spiritual needs!! You are a blessing to us all, dear friend! oh how sweet,we have four little friends we take care of and mamma is close to give birth again soon.More mouths to feed,boy food is getting very costly.We really love our furry ones.God bless you and keep you safe and well ! Having never served in the military, I cannot say. Are these tanks or are they transporters? If they are tanks, where are all of these tanks being transported to? And why? What is the purpose of moving them cross-country? Always enjoy your reports and research. Thanks for all you do for so many. Glad to see that the Lord has provided you with a beautiful setting. Exciting, strange and turbulent times ahead. Keep going and be encouraged that some folks are actually watching and listening, when ‘Dancing with the Stars’ isn’t on, that is . Do I have to say jus’ kiddin’? ‘Cottonball’ is beautiful! So glad you have a nice place for yourselves and your pets to roam. Thanks for the update Larry. 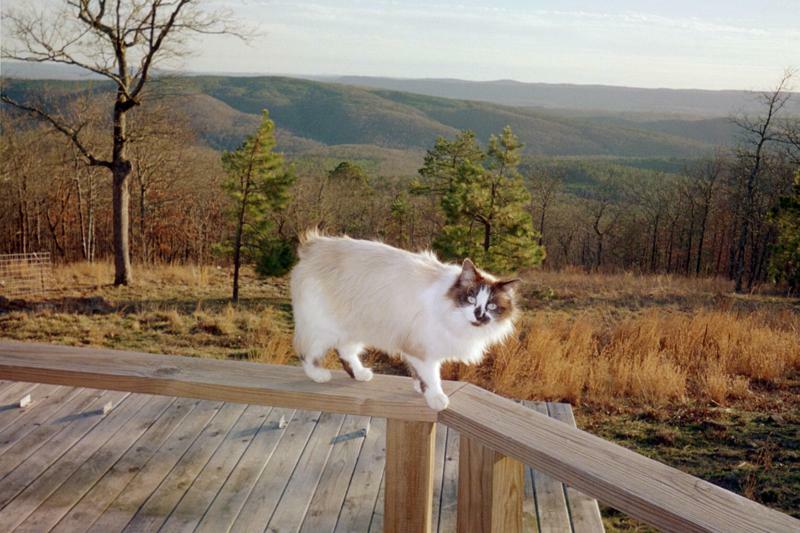 Love the pic of “Cottonball”…..love the kitties myself. Looks like the LORD has sent you to a secluded beautiful spot in OK. So happy for you. Thanks also for link to the song, cried all thru it. Continue to pray for you & Darnette, His protection & health! I pray YHWH’s perfect will & protection for all the true watchmen daily. Here is a very useful and free 3D Global Earthquake Tracker in real-time. Love the Blog! What a spectacular view! And of course a spectacular Kitty too! Honestly, I didn’t know that Oklahoma had such places… I’ve only “breezed thru” on the highways and flatlands. God is soooo good! Thank you so much for all you do Larry! this is an e-mail from my friend in MN. p.s. i love the pic. of your new place, looks solitary and quiet! Yes it is already starting!!! Rice at Wal-Mart went up from $7.00 a bag to $14.00 a bag!!! In 1 week!!!!!!!! why? you ask? because Brazilian rice producers will not accept US dollars the money had to be converted to the euro first before they would accept payment!!! You think that is something get this!!!! I buy my cigarette tubes from the local tobacco shop and I stopped in today to see what a case of cigarette tubes would cost! I asked the owner can I get a deal if I buy a whole case of tubes and he laughed and said you got to be kidding! I ordered 150 cases of cigarette tubes last week and I got 2 shipped in and my supplier said the reason it is so hard to get them is because they are mostly all manufactured over seas and they said the manufacturer will not accept payment in US dollars!!! He said the manufacturers said it is easier for them to sell over there and get euro’s for them they don’t trust the US dollar! Do you see the trend!!!!!!! I asked him when he was getting more tubes in and he said I have been on the phone the last 2 days and can’t get any because they don’t want US dollars as payment!!! So I bought all the rest he had!!! I am telling you this you are going to see this starting to happen every where manufactures over seas will quit accepting US dollars for payment and prices will spike because US dollars will have to be converted to euro’s this is no joke!!!!!!! !